Carolyn McIntyre has always been passionate about physical activity. Growing up, she was a competitive varsity athlete, spending countless hours training for and playing hockey. Her love for movement later drove her to complete a Masters of Science in Physiotherapy from McMaster University in 2008, followed by eight years of providing in-home physiotherapy services to geriatrics. 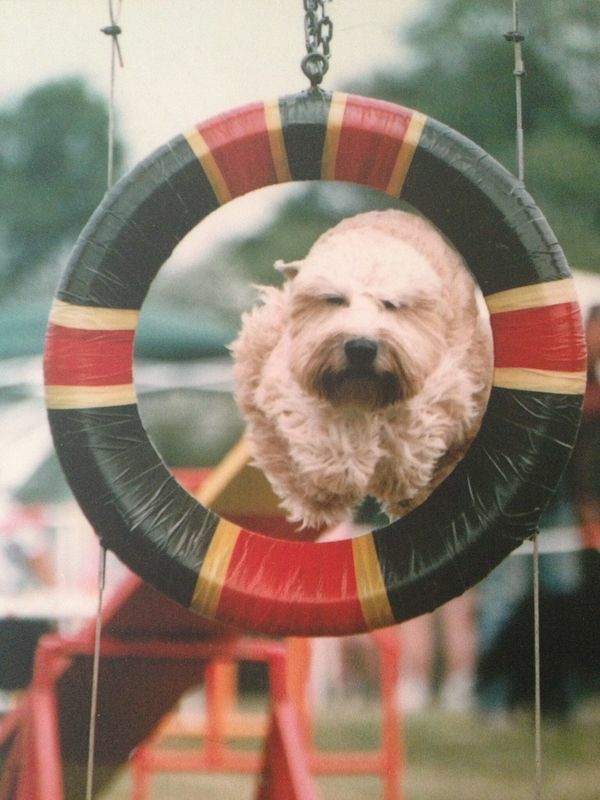 In addition to being a natural athlete, she also dipped her toes into the world of dog sports with her wheaton terrier Casey, her first performance dog, and became hooked. ​Years later, when she brought home her wild and reckless aussie Quinn, she realized both of her worlds- physiotherapy and dog training- had more in common than she initially realized. After watching Quinn launch herself into jump bars and off of contact equipment, Carolyn committed herself to looking at ways to bring all the benefits of strength training, body awareness, and mobility that she saw with her human clients to canine athletes. In 2014, Carolyn began her specialized training in canine rehabilitation from the Canadian Physiotherapy Association. In 2016, McIntyre Canine Rehabilitation (or MCR as we like to call ourselves) was founded and developed with the goals to restore, maximize, and improve the physical capacity of all dogs, from puppies to seniors to performance dogs. In order to make canine fitness and rehabilitation accessible to as many people as possible, Carolyn created a mobile service that travels to client's homes, trials/show sites, and training centres to complete comprehensive canine assessments and deliver practical workshops for every dog owner. She is especially passionate about injury prevention and making it accessible and affordable to all clients by using minimal equipment, easily stored and used at home. Kayla was first introduced to the world of dog training and the sport of agility in 1997 with her childhood dog Zoë, a Labrador Retriever. Her interest in performance sports and dog training grew from there. Since then, Kayla has trained in a number of dog sports including conformation, obedience, rally obedience, dock diving, lure coursing and field. She currently trains in agility, barn hunt, and scent detection with her three dogs; a 9-year-old Weimaraner named Brisingr, and her 4-year-old and 2-year-old Alaskan Klee Kai Valor, and Fenris. Kayla's wide range of dog sports experience means she is knowledgeable in the physical demands of numerous dog sports and the areas in which performance dogs can benefit from canine conditioning. After her first dog, Piper, displayed stiffness in her rear end at an early age Kayla was introduced to the world of canine conditioning and rehabilitation. She is a firm believer in the importance of early preventative care and conditioning exercises to ensure a long and healthy life for both the performance and companion animal. At MCR, Kayla is the behind-the-scenes marketing and social media wizard. She has a background in print journalism and currently holds a Master of Arts degree from Wilfrid Laurier University. When she's not with her dogs or working with Carolyn, she is a full-time graduate student working on her doctoral thesis in the field of International Relations.